Each year, more than 200,000 patients die in Intensive Care Units (ICUs) in the United States. When stakes are high, the quality of care delivered to patients in the ICU is critical. To improve this quality of care, hospitals can staff their ICUs with intensivists, specialists board certified in critical care medicine. They learn to manage problems in the ICU and help to reduce errors. There are higher death rates in hospitals where ICU patients are not cared for by intensivists. Leapfrog evaluates adult and pediatric general medical and/or surgical ICUs and neuro ICUs in hospitals across the country through the Leapfrog Hospital Survey. This section of the Survey is one of Leapfrog’s original quality and safety standards. All critical care patients in the ICU must be managed or co-managed by physicians who are board-certified in critical care medicine. Those intensivists must be present in the ICU at least 8 hours a day, 7 days a week either through on-site coverage or a combination of on-site and tele-ICU coverage. Intensivists must also respond to texts/calls/pages within 5 minutes at least 95 percent of the time, and be able to rely on another physician to reach the patient within 5 minutes at least 95 percent of the time when they are not in the unit. Research indicates hospitals that staff ICUs with doctors specializing in critical care medicine can reduce ICU mortality by as much as 40 percent. Additionally, advanced ICU staffing can reduce overall hospital and ICU length of stay. By implementing the Leapfrog ICU staffing standard, hospitals can greatly improve their quality of care and patient safety in the ICU. To expand intensivist coverage, Doylestown Hospital, in Doylestown, Pennsylvania, consulted with its doctors to determine the best way to implement the Leapfrog standard. Together, they decided to augment the current practice by adding in-house critical care physicians to serve as full-time intensivists in order to meet staffing requirements. Doylestown Hospital also consulted its board, established a budget and approached donors to manage the financial challenges the hospital faced in light of these efforts. 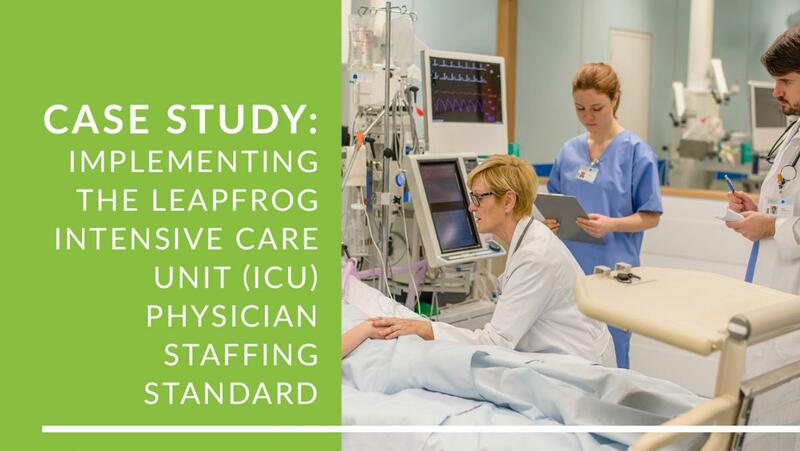 Two years since implementing new processes to fully meet Leapfrog’s ICU standard, Doylestown Hospital is extremely pleased with the results it has seen in its ICU unit, including a decrease in mortality rate and in length of stay. Expanding staffing coverage has enabled multi-disciplinary rounds on every patient in the ICU. This not only allows the entire health care team to discuss a patient’s case, but also ensures a physician is available to answer questions and assist patients and their loved ones at all times, greatly benefiting both Doylestown’s staff and patients. Doylestown began implementing their ICU staffing standard in July 2016, the start of their fiscal year 2017. The table below shows ICU metrics at Doylestown Hospital from fiscal year 2014 through the first half of fiscal year 2018. In 2017, almost 2,000 hospitals submitted a Leapfrog Hospital Survey, a national non-profit initiative conducted on behalf of hundreds of employers and other purchasers of health care across the country. Purchasers and national health plans request that all general acute care and pediatric hospitals in the U.S. complete the annual survey, and reports those that opt out as “declined to respond.” Results compare quality and safety, reported by hospital, and are used for public reporting and payment strategy. Reporting to the survey is free for all hospitals and the results are available to the public. For more information on completing the Leapfrog Hospital Survey, visit www.leapfroggroup.org/survey. A special thank you to the Greater Philadelphia Business Coalition on Health, Leapfrog's Regional Leader in Phila, Bucks, Montgomery, Chester, and Delaware counties in Pennlysvania and in Delaware.